These bags are 650mm x 825mm approx. What gauge are these please? These sacks are 22 micron bag. This converts to approximately 87 gauge. Why can these bags not be used in a domestic machine? Designed to be used as part of the universal precautions protocol for preventing the transmission of blood-borne diseases such as HIV or Hepatitis B, the Total Soluble Laundry Sacks have been manufactured for use by linen handlers. Suitable for isolating, transporting and the disinfection of foul and contaminated linen, each bag provides a barrier between the contents and the user to reduce the risk of cross-contamination and infection exposure. Designed to be used as a liner, fill each of these soluble laundry sacks with soiled linen and load directly into the washing machine where the water-soluble sack will completely dissolve - at 65-degrees - during the wash cycle. At the end, simply dispose of the remnants of the polythene sacks for a highly effective method of preventing disease dispersion. Our Soluble laundry Sacks are also available in a Green colour, suitable for dealing with soiled and contaminated linen. 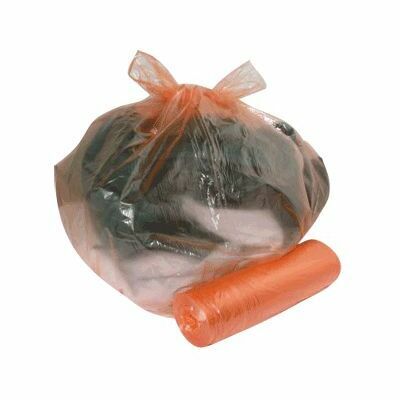 If you're looking to streamline your washing procedures, our Laundry Bags category offers everything from Mesh Laundry Bagsthrough to Soluble Sacks on a Roll. We also stock a range of Laundry Detergent from 10-litre Autodose Drums through to individual packs of Laundry Powder and all at wholesale prices.